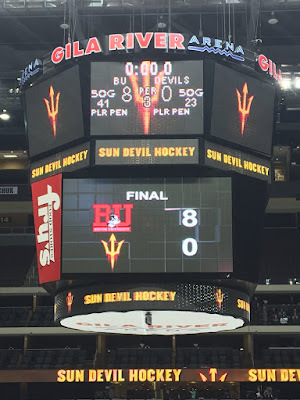 A night after a blowout win, BU received a stiffer challenge but came away with a 4-3 win over Arizona State to complete its second consecutive weekend sweep. Freshman Shane Bowers’ 12th goal of the season proved the difference, giving the Terriers a 4-2 lead in the third period before a late ASU power play goal narrowed the margin. 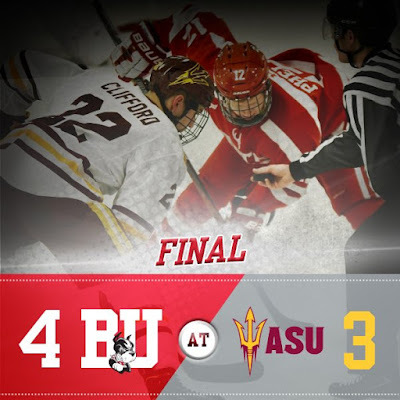 Three Terrier blueliners, Captain Brandon Hickey, Dante Fabbro and Brien Diffley also found the net, in a penalty-filled contest that saw BU take 15 penalties and 18 for ASU. Hickey opened the scoring on a power play, one-timing a Hank Crone pass from the top of the left circle. Drew Melanson also assisted. BU doubled the lead when Brady Tkachuk head-manned a pass to Melanson, who skated into the Sun Devils zone and dropped a pass to a trailing Fabbro for a one-timer from the right circle. ASU’s Johnny Walker scored a power play goal at 0;54 of the second period and six minutes later Jacob Wilson knotted the score with a shorthander. BU responded 20 seconds later when Brien Diffley scored his first of the year with assists from Nikolas Olsson and Fabbro. Bowers game-winner early in the third period on a rebound of a Fabbro shot needed an officials’ review before it went up on the board for a 4-2 lead. David Norris trimmed the margin to one with a power play goal late in the period but Jake Oettinger, who made nine of his 18 saves in the final period, slammed the door. Wilson's tally for the Sun Devils marked the first time all season that BU gave up a shorthanded goal. Oettinger has given up just one even-strength goal in the past 235 minutes of play. 2018 recruit Tyler Weiss scored a goal and Joel Farabee had an assist in the NTDP U18s’ 5-3 loss to Minnesota State. 2019 recruit Trevor Zegras scored his 10th goal of the season and assisted on two others as the NTDP U17s routed Muskegon, 10-1. Fellow recruit Alex Vlasic also had a helper. 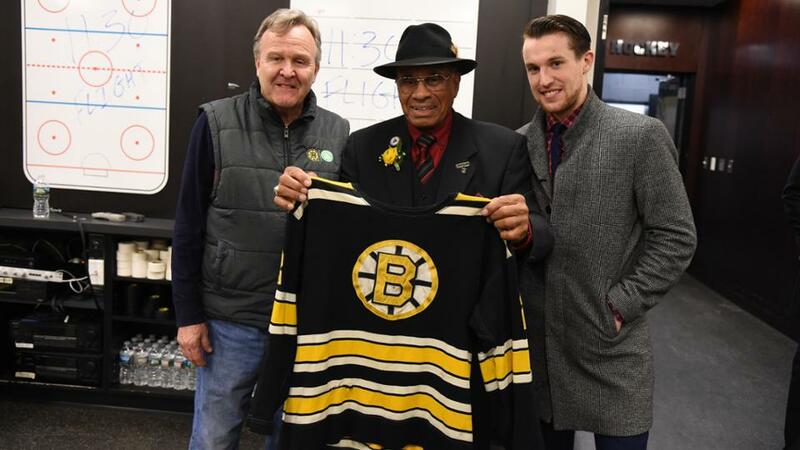 With the NHL and Boston celebrating the 60th anniversary of Willie O’Ree becoming the NHL’s first black player, Matt Grzelcyk and his father, John, presented O’Ree with his #22 jersey from the 1960-61 season. Grzelcyk’s father, a member of the Boston Garden bull gang, had been given the abandoned jersey decades ago and decided to present it to O’Ree at a milestone event. 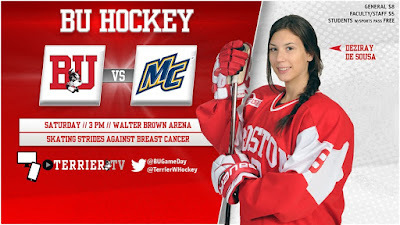 With a pair of goals and an assist, senior Victoria Bach set a new program point-scoring mark of 184 and powered BU to a 6-1 win against Merrimack at Walter Brown Arena. Bach’s power play goal early in the first was followed by scores from Nara Elia and Abbey Stanley before the Warriors scored to make it 3-1. 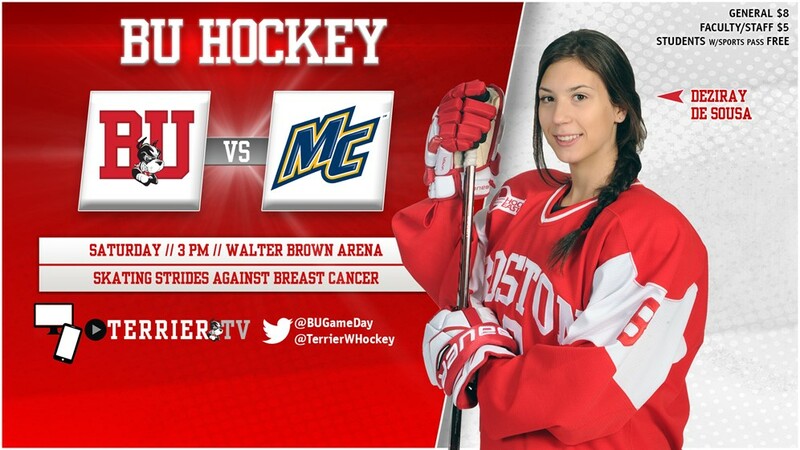 Bach, senior captain Rebecca Leslie and Abby Cook scored in the third as BU completed a sweep of the home-and-home with Merrimack.